The Great Wall of China is typically on everyone’s China bucket list so it fits in perfectly for the first thing on this list. Let’s start off by talking about some myths and rumors. The Great Wall of China was built over a period of roughly 2,000 years by several Chinese dynasties. The wall’s sections were often completed to repel whatever invading force was the current flavor of the month. The current length of The Great Wall of China comes in at around 5,500 Miles, however archeological studies have shown that the total length of the wall when accounting for all of the walls branching may have come in at an astonishing 13,171 miles! Either way, The Great Wall is the largest man made structure to ever be created. Some believe that with its sheer size alone the wall should be visible from space! This is sadly not true, the wall may be long, but when viewed from space the wall is simply too thin in most parts to be visible from space. While you can’t view it from a space station you can still view it in person. Bad for astronauts, good for you! But what should you do when you visit The Great Wall, or better question, which section of The Great Wall should you visit? Good question, you’ve got several options. If you can only visit one section of The Great Wall we’d recommend visiting the Mutianyu section. Not only is this the most well preserved section of the wall, BUT it has a slide which you can use to slide down The Great Wall of China in style. Michelle Obama has done it so you already know it’s a great time. Alternatively if you’re active you may want to head on over to the Jinshanling section of the wall which is most known for being a popular hiking spot. The Jinshanling section is also considered to be the most beautiful section of the wall, with half being restored and the other half being in relative ruin. If neither of those work for you and you’d rather be near the sea, you can always check out the Shanhai Pass which is where a section of the wall meets the Bohai Bay. Moving away from large man made structures of stone, let’s check out some large man made structures of snow and ice! The Harbin Ice and Snow Festival is an event that takes place in the Harbin area of China every year starting on January 5th. The festival tends to continue for about a month following the opening, however the site may be open beyond that first month if weather permits. Be sure to check and see if the sculptures are still around if you are visiting in mid-February so you can check out the art without the massive crowds. What exactly is the big deal about some ice sculptures though? Surely you’ve seen ice sculpture work before, although the chances of you seeing anything quite to the scale of the Harbin Ice and Snow Festival are slim. From the onset, a large city made purely of ice is built. The icy structures could be anything from fantastical castles to recreations of world wonders like the Roman Colosseum or the Eiffel Tower. Regardless of what you see when you arrive, you can be sure that it will be much larger than you ever thought an ice sculpture could be. During the night, the city of ice lights up with color as an array of colorful lights shine through the ice structures present. This means that no matter when you arrive at the festival you can be sure you’ll get to the masterpieces present. We haven’t even mentioned the massive snow sculptures that are created alongside the ice town. I’m not talking about your typical snowmen either, these artists go all out and usually create something drenched in detail. Considering the size and scope of most of the works featured at the festival, you can expect there to be several people working on a piece at any given time. This should go without saying, but if you do want to go to the Harbin Ice and Snow Festival, consider wearing non-slip snow boots. James Cameron’s Avatar was a massive box office success that has since inspired several sequels which have yet to be theatrically released! That’s okay though, while you wait for the next Avatar film in the series to be released you can visit one of the real life locations that inspired the alien world of the films! Known as the Hallelujah Mountains, these mountains are more like a series of spires that jut up from the ground. While these mountains aren’t floating, they sometimes appear to be when a fog rolls through. 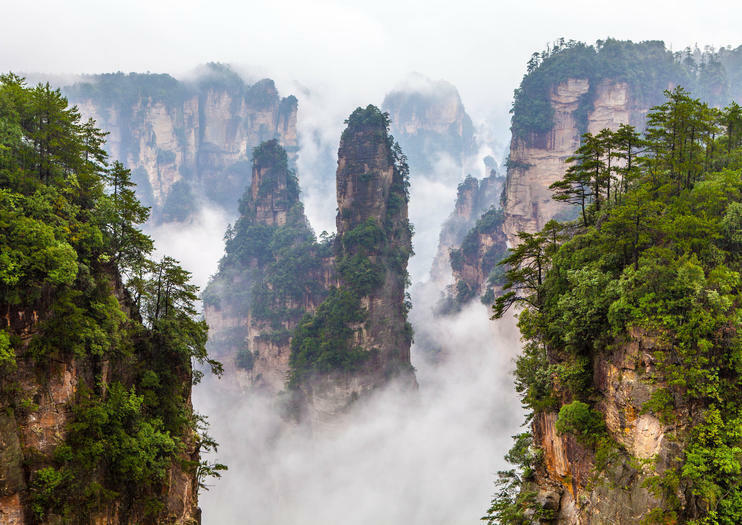 The mountains are located in China’s Zhangjiajie National Forest Park. You can either visit them on your own by simply going to the park, or alternatively you can join one of the many tours that stop by to see the mountains. If you’ve never been to China before and struggle with the local language and culture we’d recommend joining a tour group. Tour groups also have the added benefit of going to more than one location! Several tours that visit the Hallelujah Mountains also stop by to see the section of The Great Wall what slithers through Hunan province. Two birds, one stone, and more time for you to soak in the sights without worrying about where you need to go next. Careful not to drop your passport off of the side of the mountain, if that does happen you’ll need to jump through hoops to get both a new passport and a new china visa. We actually have an article on what to do should you lose your chinese visa, check it out after you’re done reading this! Now for some interesting facts about this even more interesting site! The mountains, which were previously known as the Southern Sky Column when Avatar was released, were renamed in 2010 in honor of the film and its environmentalist message. Also, when Avatar was released there was a trend of depression amongst film viewers who were bewildered to believe that the alien world featured in the film was actually just CGI and not an actual place you can visit! Fortunately for you all, you now know that at least you can visit the Hallelujah Mountains and at least get a taste of what the films had to offer. I suppose the city can’t be ALL that forbidden if we’re advising that you go there, but it is quite something else. The Forbidden City was once the seat of the Emperor of China, as such the city was reserved specifically for the ruling class to enter. Like most former seats of power, us lower class plebians are now free to walk the grounds as if we were royalty. I should also mention that while it’s called the “Forbidden City” it’s actually a palace complex and not a fully stocked city. Now that we’ve got all of the formalities out of the way, what is there to do in The Forbidden City? Outside and around, The Forbidden City there are also some things to do. The Imperial Garden which was of course formerly owned by the emperor of China are now also open to the public. Like you’ll find with many of the major tourist spots in China, The Great Wall is not far off, so you can always check it out when you’re getting a peek at The Forbidden City. Naturally you’ve got your standard historical sightseeing fair, the entire palace has been converted into a museum, there are exactly 980 surviving buildings in the forbidden city so there’s quite a bit to actually see within the walls of the city. There is a litany of priceless ancient artifacts on display in the museum itself, from old weapons to the jewelry once worn by the rulers of China. Lucky for us, the Communist party of China doesn’t care much for ancient Imperial Tradition, so we’re free to walk through the previously VERY private throne room. Be warned, many people visit this ancient landmark everyday, in fact about 15 million people visit The Forbidden City every year! So be prepared to share the space with other tourists like you when you visit this must-see tourist destination. Just be careful not to do anything that may damage any of the artifacts, that’s a one way ticket to losing your China Visa and getting deported. The statute that sits atop the Golden Summit Temple is a power depiction of Samantabhadra who’s ten faces face a different direction for each of the Bodhisattva’s ‘Ten Truths of Universal Worthiness’. While this isn’t the largest statue in the world, in fact it’s not even the largest in China, the Golden Summit Temple is a deeply historical place when it comes to the formation of Buddhism within China. UNESCO has declared this site as a world cultural heritage site. Some of you will be turned off to visiting the Golden Summit Temple as you may not be as into ancient holy sites as you are sliding down the side of The Great Wall. However, for those of you who are serious culture nerds the Golden Summit Temple is a must see. You can either venture up the mountain via cable cart, or for those of you who are spry and adventurous you can instead walk up the mountain. Be warned, walking up the mountain takes roughly two hours and the incline may be a challenge for those not used to walking uphill. Once you finally reach the summit you’ll be greeted not only by the effigy of Samantabhadra but also by the Golden Temple itself which sits atop the summit as well. You may also snag a peak of the Leshan Giant Buddha which is carved into the side of a mountain. The Leshan is also not the largest statue in the world but it’s much larger than the golden monument laying atop the mountain. All in all, this little destination may be out of the way for your typical tourist, however those dedicated few who really wish to immerse themselves in the deep culture that China has to offer would be foolish to skip out on this spot. Now that you’ve got a rough idea of what to do once your in China you’re all set to head over! Just kidding. If you’ve never been to China before you’ll need both a passport and a visa! If you don’t have either and are kicking yourself, fret not, we are here to help. We specialize in expediting both passports and visas! Within a few days time you can have both your US Passport and your Chinese Visa ready! So what are you waiting for? Click here to learn more about applying for a US Passport with the Passport Office, and click here to learn more about applying for a Chinese Visa with China Visa Department. This entry was posted in china visa and tagged china visa tips, travel by admin. Bookmark the permalink.